In order to prepare yourself for the cook school; it is important that you like to cook and realize that this school is geared towards preparing students to work for backcountry outfitting operations. The camp is set up with wall tents; you will live in one for the duration of your schooling and your instruction will be in the 18'x24' kitchen tent. There is no electricity or running water at camp. We are next to a stream and there is gravity feed shower system. 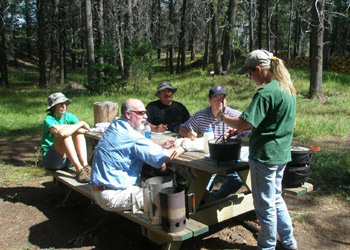 The cooking school teaches different cooking and baking techniques and skills plus the logistical side of operating a hunting camp or a summer pack trip camp (menu planning and grocery purchasing, etc.). It is a lot of work, planning and thinking, but will be well worth your time if you are serious about cooking for outfitters. My students are in high demand because hiring outfitters know I teach the proper skills and conduct. If you are looking for a cook education vacation, I would suggest a 4 day dutch oven class. Week 2: Menu planning and time to cook and run the kitchen by yourself. You will cook from a menu that has new and different recipes than you have made in the prior week. There will be little to no assistance from myself and staff. It is your time to put it all together and learn from your own mistakes. In the kitchen by 5:30 am on most mornings. Practice making different breakfast meals. Short break around 8 am. Then lecture on various lessons such as yeast bread, Dutch ovens, Riley oven, menu planning and sourdough. After lecture there is "practice and do it yourself time". This will go into the afternoon to prep for dinner at 6 pm. There is a lunch break at noon. After 6 pm, we clean up the kitchen and prepare anything necessary for the following morning, such as making sure lanterns are filled, water buckets are full, kindling box and wood rack are full, and coffee pot is filled with water. Usually by 7:30 pm you are done for the day. Camp Cook -- prepares, serves, and cleans up after meals for clients and crew. A good one must be highly organized, very neat and clean, and enjoy putting some effort into turning out a good home-cooked meal whether for 6 or 16. Sometimes the cook plans menus and orders food and supplies. The cook often works both in camp and on the trail and must be flexible and able to cope without modern conveniences. The cook is also often the camp jack. Camp Jack -- is responsible for fuel and water supply, camp maintenance and a wide variety of camp chores. Most outfitter camps keep a lot of equipment and supplies on hand. Every item must be kept neatly stored and in good working order to be available at a moments notice.